2012 marks the 125th year of Sony Music, the company who brought us some of the most iconic records in musical history. And to commemorate this milestone, Sony Music has unveiled an amazing graphic installation documenting the highlights of the company’s 125-year history. The project was a massive showcase of typography and illustration spearheaded by London-based designer and Creative Review’s “One to Watch” 2011 winner – Alex Fowkes. The project is called Sony Music Timeline that runs throughout the central atrium of the company’s open plan Derry Street offices. 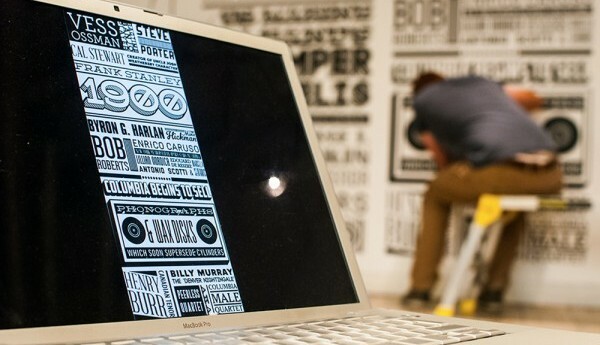 The graphic installation is a combination of amazing use of typography and illustration featuring nearly 1000 names of artists signed to Sony Music and its affiliated labels which covers from the foundation of Columbia Records in 1887 to the present day. The display uses CNC cut vinyl and is divided by decade into 54 columns measuring more than two meters tall and covering almost 150 square meters of wall space. YTD: Hi Alex, tell us how did you land on this amazing project with Sony Music. ALEX: The email landed in my inbox from Emma Pike the VP of Industry Relations with the timeline brief. She had been recommended to me by a Creative Director at Sony who had seen my work at D&AD New Blood which is a graduate show in London a couple of years ago. I had kept it touch with the Creative Director on Twitter, etc. There was a pitch process for the job with at least 3 other studios/designers. Getting the email saying I was selected was very exciting. YTD: How long did it take you and your team to finish this project? ALEX: All the artwork was created by myself, the video was shot by my good friend Rob Antill and the music was from another good friend, Joseph Bird. The whole project from the very first meeting to the going out of the press release was about 6 months. One month meeting and planning two months design work. About six weeks at the printers creating the columns, a weekend to put up and then two weeks finalizing photography and video. YTD: There is a massive showcase of typography in the wall installations. How do you decide on what type to use in each text/section? ALEX: I limited myself to around 50 typefaces, many of these then have various type treatments applied giving me at least four different feels for just one typeface. That way I didn’t get lost in hundreds of typefaces, some of my favorites have to be from Lost Type Co as they have a really varied batch and still retain a playful nature. YTD: Which part of the project is your most favorite? ALEX: I think the finish and the overall impact in the space is my favorite part. This is one thing I couldn’t of planned or understood before it went up as its something you have to experience when you are in the space. So walking across the bridge or entering the cafeteria from different angles is my favorite as only then do you get to get a real feel for how its effecting the environment. YTD: Thank you Alex for sharing your amazing talent and this incredible project. Anyone you would like to be thankful for? ALEX: Yes, first of all I’d love to thank Emma Pike and Paul Bursche at Sony for sending me the brief and being so supportive and amazing throughout the whole process. Its really has been a pleasure to work with them. Another high on the list is Rob Antill for coming to London to film the whole process on various occasions. Joseph Bird for his music masters. Norm at Waste Studio for letting us use and abuse his lovely studio space for filming. Also, everyone that helped, gave feedback and aided me along the way. “The brief was to bring the inspiration of our music into the heart of our building and make our office space live and breathe our incredible musical legacy. Alex’s beautiful graphics and illustrations do exactly that.” – Emma Pike, VP Industry Relations, who commissioned the project. The partnership of Sony with Alex is set to continue as the Sony Music Timeline will grow each year adding new artist names to their roster signed by the music label. Check out more amazing works of Alex Fowkes in graphic design and illustration on his official website. Video and photography in this project were provided by Rob Antill and music by Joseph Bird via Avenue Beech. Also, find out more details about the Installation in the Sony Music Timeline website. Tell us your thoughts about Alex’s amazing graphic installation as well as your suggestions by commenting below. Find us on Facebook, Twitter and Google Plus for more updates, design news and features, or better yet subscribe to our blog for the latest design inspirations, stories and freebies. Stay awesome everyone!